"One moral truism that should be uncontroversial is the principle of universality: We should apply to ourselves the same standards we apply to others -- in fact, more stringent ones." 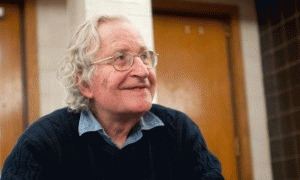 Chomsky's point is that Western elites carve out an obvious exception for themselves -- they deem their own countries "to be uniquely exempt from the principle of universality." The crimes of enemies take place; our own do not, by virtue of our exemption from the most elementary of moral truisms." "If any international norm can still be called uncontroversial, it is the stricture against cross-border aggression by one sovereign state against another. Certainly any failure to enforce it in one place invites violations elsewhere." The paper cannot possibly mean this to be taken literally, for it amounts to a call for someone to stop the United States. Of course, their words are not to be taken literally. The paper has been highly critical of the White House's decision to withdraw troops from Iraq and Afghanistan (most recently last week); they would prefer prolonging those conflicts. The paper's advocacy for US wars during the Bush years is well-documented; it ran a couple dozen editorials in support of the Iraq invasion, which one should agree was an act of "cross-border aggression." The other US wars of the moment, waged via drones and airstrikes, receive enthusiastic support from the Post. And it has been one of the most enthusiastic supporters of striking Syria. The record -- of which one could say plenty more -- speaks for itself. It is difficult to find a coherent explanation for the Post's apparent position that Putin's aggression so obviously violates "international norms" that are "uncontroversial," but US warmaking is, if anything, insufficiently aggressive. Unless you accept that the kind of people who edit the Washington Post are the kind of people who do not believe that "universal norms" apply to everyone. Chelsea Manning Speaks -- But Who Listened? NYT Rewrites Gaza Headline: Was It Too Accurate?